Dandie Dinmont Terrier – The Gentleman of Terriers! Looking for a pet with an angelic expression, gentle, affectionate personality and a skill in hunting rats and badgers? 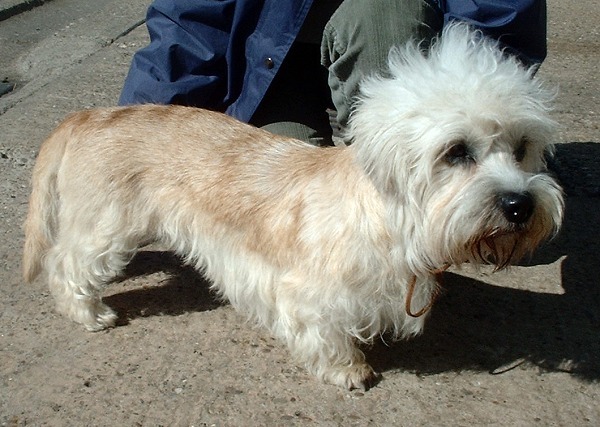 Then the adorable Dandie Dinmont terrier is just the pet for you! Find out all you need to know about its temperament, breed specific health concerns and characteristics of this cute dog! The breed originated in Scotland. They were earlier known as the Mustard and Pepper terriers. Sir Walter Scott mentioned the Dandie in his book Guy Mannering which actually led to the name ‘Dandie Dinmont terrier’. The popularity of the novel also led to the promotion of this breed. Physical characteristics- The Dandie is a small dog with unique dome shaped head. They have a curvaceous body that is higher at the loins than at the shoulders. Weight is from 14-24 pounds with ideal weight of 18 lbs. Height is between 8-11 inches. Dandies make excellent all round pets but they were initially bred for sports and games. They have a great sense of smell that makes them excellent for hunting rats and other small animals. Their instinct makes them great hunters but not good retrievers as they break the bones of the animals they hunt. Dandie Dinmont terriers are extremely intelligent dogs and experts attribute this quality to the larger heads. This attribute also makes them independent thinkers which could be detrimental during training. Although bred for game and quite hardy, the Dandie is a ‘gentleman’ of all terriers. They make a lovable and affectionate pet but have the tendency to attach themselves to one particular person and that need not be their owner. This could lead to jealousy and over attachment and woe be to the intruder who comes in the way of their perfect world. He is slow to rouse, but once roused, he can be a veritable demon. Dandies are wary of strangers and will not rest until they are assured that the person is not a source of harm or menace to his household. They have extraordinarily deep barks for their small size. Dandie Dinmont terriers can be described, in three words, as intelligent, affectionate and reserved dogs. Where to find dandie dinmont terrier puppies for sale? The best places to buy a Dandie Dinmont terrier puppy is from reputed breeders. 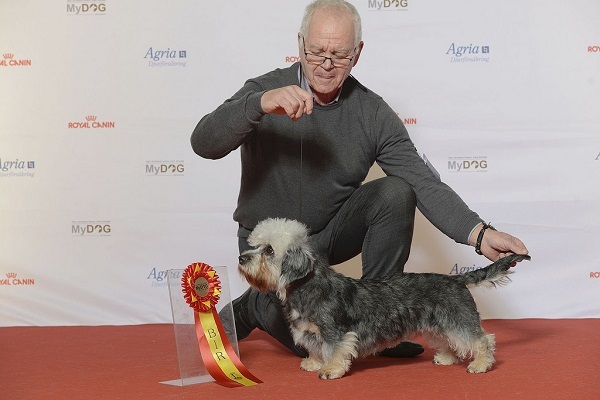 The DDTCA is a good place to find registered Dandie breeders.I would certainly not recommend getting one from pet stores as the dogs there are usually a product of puppy mills. Note that you could buy from the best breeder in your area and your pup could still have health issues. That said; buying from ethical breeders ensures that you get to see the paperwork for the dog and also meet its parents. 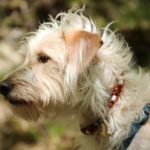 Better breeders will also talk about everything you need to know about owning your Dandie-its food, temperament, genetic testing, and vaccinations etc. Do not hesitate to ask the seller to defend the price of your puppy-someone charging a premium amount should not hesitate to tell you why s/he has a premium product. 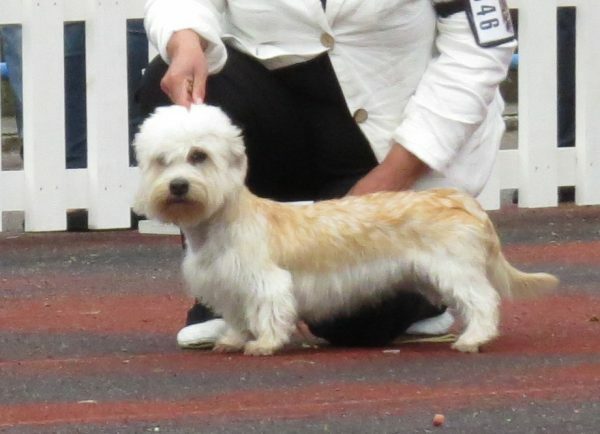 Dandie dinmont terrier price varies from breeder to breeder and usually is in the range of $1000 to $1500. 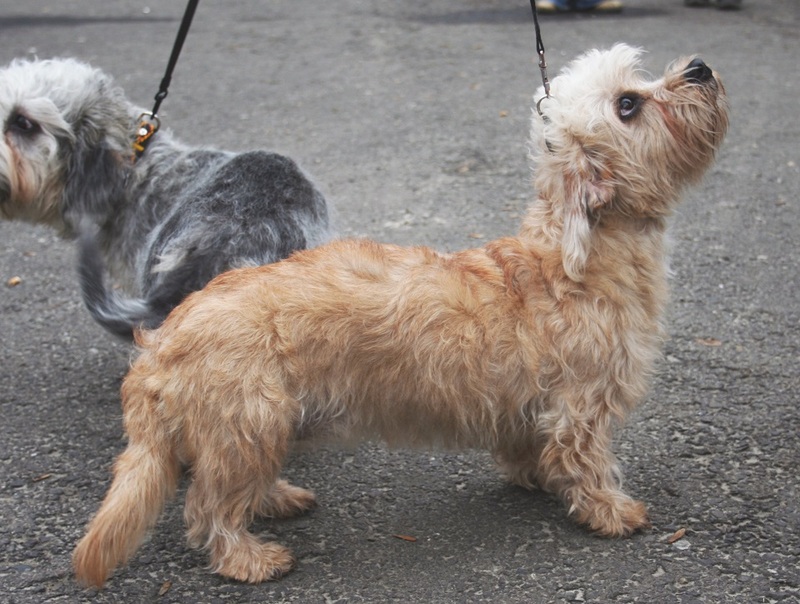 If you decide to adopt a dandie dinmont terrier rescue, do talk to the shelter about the dandie’s mother and whether she is up for adoption as well. You might not want to keep the older dog but at least you’d know whether the organization is working to help more than just sell puppies. The Dandie Dinmont is quite easy to train. However, early training, obedience classes and socialization are a must in order to maximize your chances of having a dog you can live with as he matures. Terrier breeds all have an instinct to harass and kill small animals. 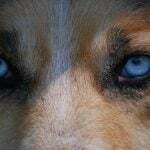 So teach your dog basic self control so that s/he does not chase or harass rabbits, squirrels or other small animals. Search for well-structured puppy classes in your area so your Dandie dinmont terrier puppy will learn to sharpen some aspects of his terrier personality including tenacity, unwillingness to back down etc. This is a good dog breed for individuals or families. They need moderate levels of exercise. Your dandie dinmont terrier puppy will have boundless energy which you must help expend through activities, games and training. But as your dog matures, its activity needs might naturally reduce. However, twice a day short walks are still recommended to keep your Dandie in good shape mentally and physically. Feed your Dandie twice a day-good quality dry kibble with chicken meal, rice flour and fortified vitamins and minerals will keep him in good shape. Look for foods with 28% protein, 17% fat and at least 4% fiber for the young Dandie. If you don’t mind going the extra length, make homemade food for your beloved pet. I recommend a stew with sautéed ground beef and vegetables like carrots, green beans and pumpkin. Add this over the kibble and your pet will empty its bowl in no time! Dog food manufacturers often state that dogs do not need too much variety in their food but I personally love to give my pets occasional treats. Thankfully, there are many quality commercial foods available in tasty flavors and you can certainly experiment with them. A word of caution: do not overdo this else you could end up with a fussy eater. This is certainly not a wash and wear breed. If you hate daily combing, clipping, and regular bathing; then the Dandie is not for you. Grooming is a fun task but it is certainly not everybody’s cup of tea. If you feel you are not able to manage it, you can always seek help of professional groomers. Note that this is a relatively rare breed and not all groomers may know how to groom. Once a week, trim your pet’s toenails and brush its teeth daily. Dandies are sensitive about their paws and hate having them handled. So do get your pet used to nail clipping and teeth brushing from an early age to prevent issues later. Dandie dinmont terriers do not blow their coat but they bring a lot of dander into the house. Mother Nature intended the Dandie’s coat to be pulled and no, it doesn’t hurt them. 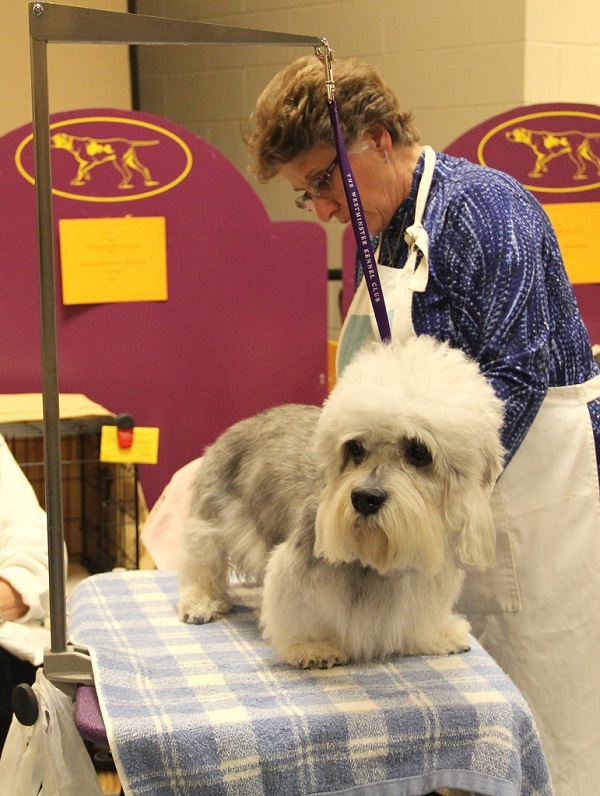 Dandie fanciers love grooming their pet and enjoy the bonding it creates in the process. Note that grooming can be a time consuming process so be patient and consistent and soon your pet will look like the ‘dandy’ he is and that should be your goal! Common health issues seen in this breed are hip dysplasia, cataracts, epilepsy and cardiomyopathy.Genetic testing can help detect some of these disorders. As stated before, buying from reputed breeders can help you acquire a problem-free pet. Dog Skin Allergies – My Dog Has Dry Flaky Skin and Scabs – What Do I Do? 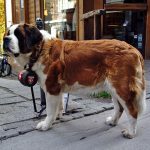 St. Bernard Dog Breed – The Guardian Angel with a Barrel!